Shockwave Medical has secured CE mark for its Coronary Lithoplasty system to treat calcified plaque in conjunction with stenting in patients with coronary artery disease. The company developed Coronary Lithoplasty system to treat calcified coronary artery blockages with lithotripsy and sonic pressure waves historically used to treat patients with kidney stones. The efficacy and safety of the Coronary Lithoplasty system has been demonstrated at the DISRUPT CAD I pre-market and prospective multi-center single-arm study carried out at seven centers in Europe and Australia. The study assessed the use of the Coronary Lithoplasty system as a treatment for calcified coronary arteries prior to drug eluting stent (DES) implantation. Coronary Lithoplasty system is said to incorporate angioplasty balloon catheter devices with the calcium-disrupting power of sonic pressure waves called lithotripsy. Each Lithoplasty catheter integrates multiple lithotripsy emitters activated with the touch of a button after the balloon is inflated. Once mobilized, the emitters generate therapeutic sonic pressure waves that are inherently tissue-selective and pass through the balloon and soft vascular tissue, specifically disrupting the calcified plaque inside the vessel wall to create a series of micro-fractures. The vessel can be dilated using low pressures when the calcium has been modified, helping to treat effectively with minimal injury to the vessel. In the European Union, the firm’s Coronary Rx Lithoplasty system is indicated for lithotripsy enhanced, low-pressure balloon dilatation of calcified, stenotic de novo coronary arteries prior to stenting. Both devices are investigational devices in the US, and were not yet approved for commercial applications in the country. Shockwave Medical CEO Doug Godshall said: “CE Mark for the Coronary Lithoplasty System is an important milestone for Shockwave Medical. 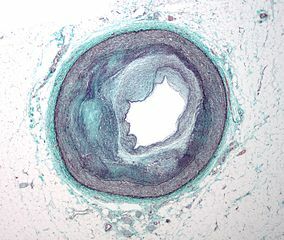 Image: Micrograph of a coronary artery with the most common form of coronary artery disease. Photo: courtesy of Nephron.